Filament floss is shiny thread that was traditionally made from silk. It is now made of polyester, rayon or nylon. This type of floss adds shimmer and dimension to a cross stitch project. While the floss is beautiful, it is difficult to work with. Below are a tips that will make sure you a beautiful finished project without the hassle. Use a larger needle size than usual when working with metallic threads and blends. It will widen the hole a bit more as you pull your threads through. This puts much less wear on the fibers. Do not use a needle so large that it rips and pulls your fabric out of shape. Use a needle one to two sizes up. When at all possible, use Accentuate, Bijoux, Treasure Braid, or Madeira brand blenders & metallic threads. 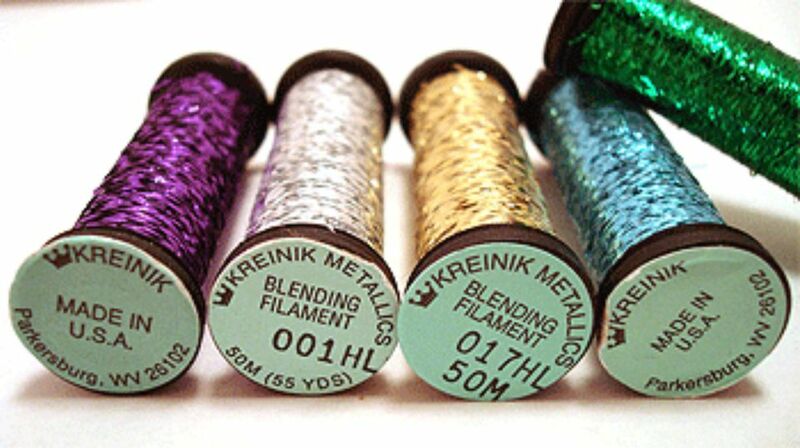 If you cannot get those brands, then Kreinik is a good second choice. When using blending filaments in even quantities (2,4,etc): Skip the "loop start", and loop the plies through your needle eye instead. To do this: Fold your threads in half; Put the fold end through the needle about 1". Then take the loose ends and pull them through the center of the loop, until they are snugly (but not too tightly) knotted around the eye of the needle. They will shift a bit as stitching, but not much, because they can't pull out of the needle eye. If using a mix of regular thread and blending filament: Stitch the bottom half of the stitch in regular floss, then only use the blending filament on the top of the cross stitch. You'll get all the sparkle, and none of the mixing hassle. If you double your thread (2 plies) and knot it in the needle in #4, then you'll get good coverage too. Another mixed thread & blending filament trick: Use only one ply of the blend loose in your needle, and stitch the top of each cross stitch twice. This is especially nice for scattered stitches, or areas where only some of the stitches have that color of sparkle. The washcloth or sponge trick: Keep one of these very slightly dampened at your stitching station. Prior to stitching with rayon, blenders or metallic floss (or even during), run your needle and thread through the very slightly dampened cloth/sponge. It smooths the fibers and removes the static electricity, without leaving any kind of film that could cause problems in later years. This tip comes directly from Kreinik Corp. It also works beautifully on many 12-ply silks like Caron's Waterlilies and Crescent's Belle Soie, which are all wavy when you separate them. Before using this technique on hand-dyed threads, check them first for color fastness, but the low dampness is OK for hand-dyed fabrics. Do not use waxes or other floss softeners when stitching with filaments.These products leave a permanent film on the fibers. Even if that film remains inert, its long-term effects are unknown.If you must use this product, buy two containers. Keep 1 only for metallic threads and blending filaments. Use the other for silks or rayon threads. That prevents sparkle bits from ending up in places where you don't want them on the fabric. Take care of your hands: Use home-made or store-bought "sugar scrubs" often, or get regular a manicure to keep your fingers smooth and free of hangnails or rough patches on skin or fingernails.You can make your own sugar scrubs and lotions if you do not like store-bought ones. Hangnails, rough skin can catch the filament floss and cause damage. It will cause the individual strands of floss snag and pull apart. Use tools to manage your threads: You do not need a special tool to do this. Something as simple as a large tapestry needle, your spare fingers, or a laying tool to help guide your threads and keep them all smooth. Most people will use their finger/fingernail, or extend their finger's reach by using a "Trolley Needle" laying tool. If you choose to use filament floss in your next project, the above tips and techniques will help you create a beautiful cross stitch piece with dimension and shimmer.